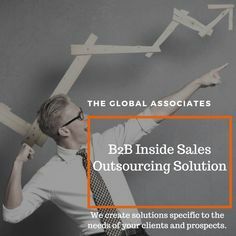 The Global Associates Telesales Companies often tend to put added pressure on their sales teams, setting lofty goals and making them use over-aggressive tactics. However, the business scenario has undergone a metamorphosis in past two decades; hard-sell tactics don’t work for telesales companies any longer. What can elevate the status of a sales organization from a mediocre one to a top-flight company is adopting some new-age tricks of the trade. Following are some important things that a sales organization should learn in order to grow their business and enhance their profit margins. Telesales companies must realize that the business of sales is all about building long-lasting relationships. It’s all about an interaction between two parties, people won’t entertain you unless they trust your intentions and capabilities. You need to build credibility over time with your efforts. Engage the prospects in lengthy conversations and convince them about your expertise and good intentions. Cold calling is an art you need to master. A telesales organization makes a lot of calls every day in order to reach out new prospects, but most of them adopt a machine gun approach that seldom works now. One must adopt a rifle approach since it allows them to focus on the needs and pain points of the prospects by researching more thoroughly and empathizing with them during the initial conversations. Identifying their main issues enables you to guide the conversation towards a solution that is custom made for their requirements. You are there of course to sell your products, however, presenting yourself as an outright sales person is not going to work. Remember, it’s not about you, it’s about the customer. You are not supposed to bluff your through or bamboozle them to buy from you; you are there to build a long-term relationship with them. Any relationship needs to follow a formula of give and take to work for a long time. Be generous with your approach, give them useful tips, suggest the best products suited to their needs, or help them identify their issues and find solutions for them. Your generosity will improve your chances of grabbing a good deal. Telesales companies perform the tough job of contacting complete strangers and convincing them to buy their products. Learning the above-mentioned tricks can help them improve their working and grow their businesses rapidly. Learning the art of conversation and the ability to build long-lasting business relationships, and to be generous with the clients will certainly take you to the top.